Our recent review of WD's four-bay My Cloud DL4100 business class NAS found a solid NAS that should attract many buyers seeking comfort in a brand known for storage prowess. 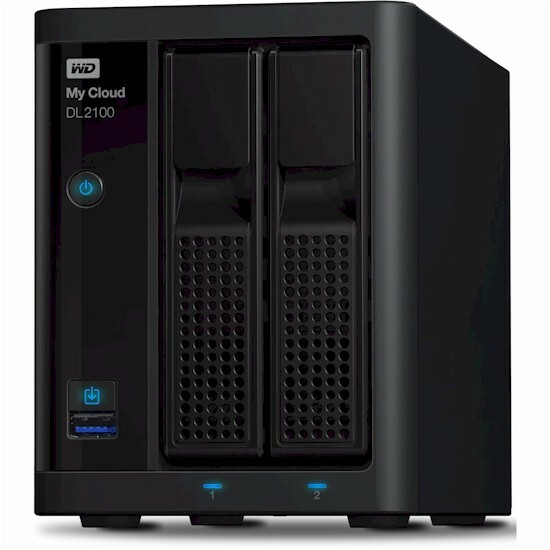 I'm doing a separate review of the two-bay My Cloud DL2100 because it uses a different Intel Atom CPU. Other than the processor swap, the DL2100 is cut from the same cloth as the DL4100, with a few minor differences. Both have dual aggregatable Gigabit Ethernet ports and two DC power sockets (1 AC adapter included). The DL2100 keeps two USB 3.0 ports but doesn't have the DL4100's single USB 2.0. It also has 1 GB of DDR3 RAM expandable to 5 GB total vs. the DL4100's 2 GB that is expandable to 8 GB total. We tested the 12 TB DL2100 model, but entered the 0 TB model in our Charts and Ranker database so you can more easily compare it to other diskless products. For SKUs that ship with storage, WD uses its Red series of NAS-optimized hard drives and, of course, recommends them for the BYOD models. The DL2100 uses a chassis design similar to the DL4100's. There are two tool-less drive bays for 3.5" SATA drives, USB 3.0 port and copy button on the front and dual power ports on the rear. You can get complete charts for LED status (front and rear panel) from the User Manual. Hit the DL4100 review if you'd like more construction / feature details. The DL2100 is powered by an Intel dual-core Atom C2350 clocked at 1.7 GHz. Other key components are summarized in Table 1, alongside the DL4100. I had the flash capacity wrong on the DL4100 review; it has been corrected to agree with what's shown below. Kudos to the WD designers for how easy they made it to take the DL2100 apart. Remove the cover, then four inner screws and it separates easily into two parts. The board half shown below reveals easy access to the full-sized DIMM slot for RAM expansion. It takes a 1x 4 GB DDR3, 1333 or 1600MHz, CL11, 1.5V Unbuffered DIMM vs. the SoDIMM on the DL4100. The other side holds the drive bay mechanics and backplane. Nice and clean. Fan and drive noise was rated very low. Power consumption for the external "brick" power supply was measured at 19 W (active) and 8 W (power save) with two 6 TB WD Red drives. The only time I heard the fan was when it temporarily spun up to full roar during boot.